Broadcast Networks Skip Weak Economic Growth? The U.S. economy slowed down so much last quarter that even Europe’s economy grew faster. But if you just watched the broadcast networks’ and Hispanic media’s evening news programs, you wouldn’t have known that. The U.S.’s real gross domestic product (GDP) only rose at a 0.5 percent annualized rate in the first quarter of 2016, marking the lowest rate since the first quarter of 2014. Even in the Eurozone, which faced a host of economic problems in recent years, GDP grew by 0.6 percent. Despite the disappointing news, those outlets didn’t even cover the GDP figure on the day of its release from the Bureau of Economic Analysis, or on the following weekend. None of ABC, NBC, CBS, Telemundo and Univision’s evening news shows reported on the slump from April 28, 2016, to May 1, 2016. Instead, evening news programs covered protesters at a Trump event, pop star Prince’s death and severe weather, among other things. 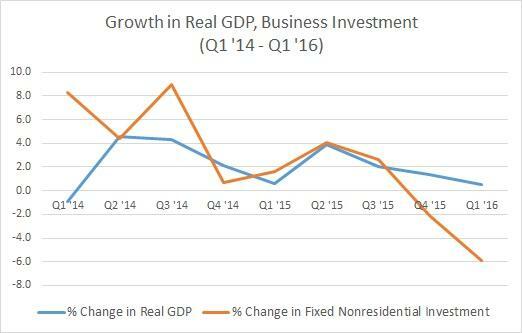 Part of the economic slowdown came from a decline in business investment, which fell at a rate of 5.9 percent in the first quarter. According to BBC, the last time business investment declined at a rate that high was during the 2009 financial crisis. The Washington Post suggested that lower global demand likely discouraged businesses from investing. “Companies are likely trimming back in response to sluggish global demand,” reporter Chico Harlan wrote in an April 28, 2016, article. This wasn’t the first time the media kept quiet about weak economic growth during the Obama administration. For six straight months in 2012, ABC, CBS, and NBC skipped the nation’s declining GDP. What motive would the networks have for not reporting this story? 3. Ask a parent: do you think the networks purposely did not report the latest slowed economic growth? Please explain your answer.